This is an English habitation name from two places in Yorkshire, Kiplin in North Yorkshire, which is derived from the Old English pre 7th century "Cyppelingas" people of Cyppel, which was an Old English personal name and secondly from Kipling Cotes in East Yorkshire, derived from the Old English "Cybbelingcot" meaning "the cottages of Cybbel's people", Cybbel being another ancient personal name. 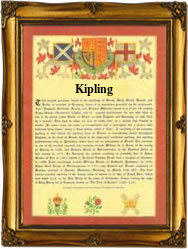 Kipling is recorded in the Domesday Book of 1086 as "Chipeling" and Kipling Cotes as "Climbicote". The English author, Rudyard Kipling (1866-1933), who wrote such favourites with young and old as "The Jungle Book" and "Just So Stories" came from a Yorkshire family who were mainly small farmers and craftsmen. The first recorded spelling of the family name is shown to be that of James Kiplynge which was dated Christened 10th January 1564, Thirsk, Yorkshire. during the reign of Queen Elizabeth 1, known as "Good Queen Bess", 1558 - 1603. Surnames became necessary when governments introduced personal taxation. In England this was known as Poll Tax. Throughout the centuries, surnames in every country have continued to "develop" often leading to astonishing variants of the original spelling.